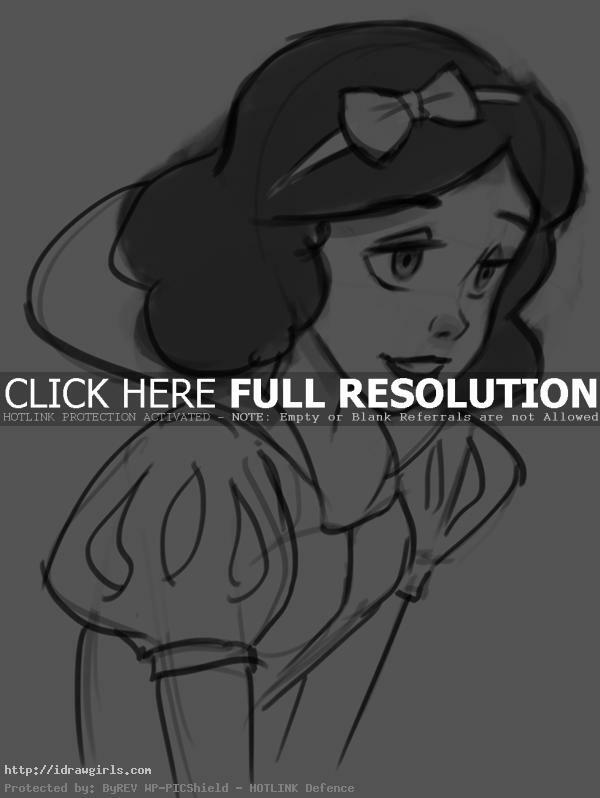 How to draw Snow White Disney style drawing. Learn to draw a Snow White Disney cartoon character from step by step image along with instruction. In this tutorial, you will learn to draw a character from classic Disney cartoon style drawing. Snow White is a fairy tale known from many countries in Europe with variety of versions. This mini lesson is a basic drawing tutorial and easy to follow. Before I start drawing anything new, I always break it down into simple geometry shapes to get the basic face and body structure first. It is a lot easier to draw once you take time to study the over all shape of a character you are trying to draw. “Snow White” has many versions from many countries in Europe, the best known version being the German one collected by the Brothers Grimm in 1812 is “Snow White and the Seven Dwarves”). Basic story of Snow White, Once upon a time as a queen sits sewing at her window, she pricks her finger on her needle and three drops of blood fall on the snow that had fallen on her ebony window frame. As she looks at the blood on the snow, she says to herself, “Oh, how I wish that I had a daughter that had skin white as snow, lips red as blood, and hair black as ebony”. Soon after that, the queen gives birth to a baby girl who has skin white as snow, lips red as blood, and hair black as ebony. They name her Princess Snow White. As soon as the child is born, the queen dies. Here is a final drawing of a Snow White. 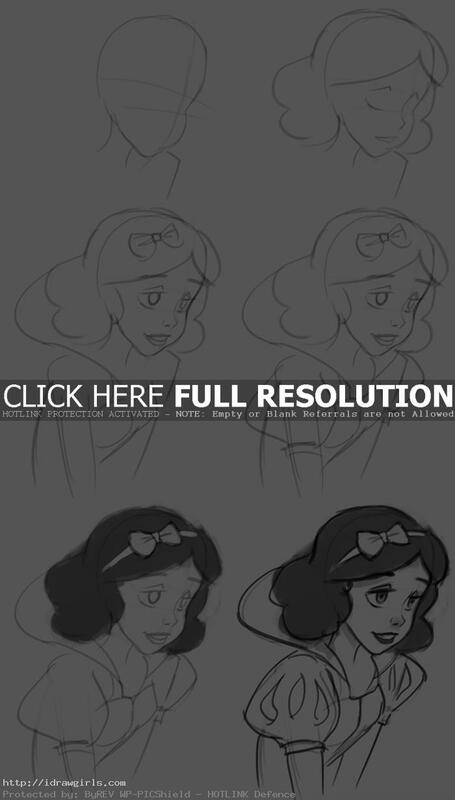 Below are step by step drawing, how to draw Snow White. Step one, I was just getting the basic head shape down. Vertical line should line up in the middle of the face. The top horizontal line should be in the middle of the head’s height. The distance between the parallel horizontal lines should equal the height of her eyes. Step two, I drew both eye shapes within the parallel lines, then nose and mouth along with her hair style. Step three, Then I added more detail inside her eyes, lips, then bow and collars. Step four, I started drawing her costume for upper body. Step four, I then clean up and erase the loosely sketch lines, remains only the solid final line drawn.